A newspaper photo of a woman who was beaten unconscious by law enforcement during a march across the Edmund Pettus Bridge in Selma, Alabama, revealed to a wider audience the struggles and violence black people faced while fighting for the right to vote. Fifty years after the beating, the activist in the photograph, Amelia Boynton Robinson, held hands with the first black president of the United States as she was pushed across the bridge in a wheelchair, trailed by many others including some who were also attacked on March 7, 1965. 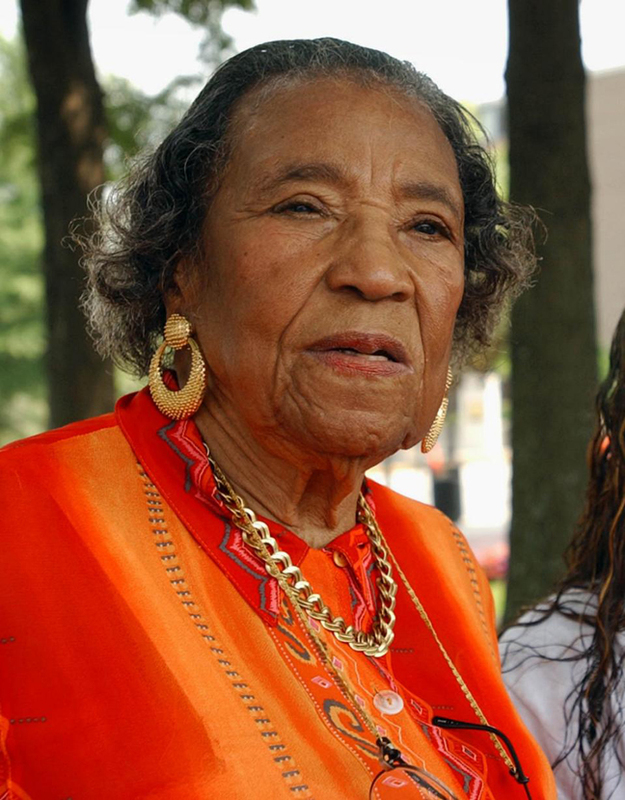 Boynton Robinson, widely considered one of the mothers of the civil rights movement, died in a Montgomery, Alabama, hospital at age 104, her son Bruce Boynton said. Boynton Robinson was hospitalized in July after a stroke and was surrounded by family and friends when she died early Wednesday morning, her family said in a statement. State troopers teargased and clubbed marchers as they tried crossing the bridge during the march Boynton Robinson helped organize. Although the attack on marchers revealed ugly realities to some about how blacks were treated, Boynton Robinson had been an integral part of the civil rights movement long before the beating and iconic photo. In January, Boynton Robinson attended the State of the Union address as a special guest of Rep. Terri Sewell, D-Alabama, who calls Boynton Robinson a mentor and a friend. Boynton Robinson was the first black woman to run for Congress in the state and the first Alabama woman to run as a Democrat, according to the Encyclopedia of Alabama. Sewell is the first black woman to be elected to Congress in Alabama. “Without her courageous campaign for the 7th Congressional District, I know that my election to this seat in 2010 would not have been possible,” Sewell said in a written statement. Sewell said she'll carry love and admiration for Boynton Robinson with her and will continue working to honor her life’s work. “As she reminded us in life, there is still much work to be done for this nation to live up to its ideals of equality and justice for all,” Sewell said. Months after visiting Washing­ton for the State of the Union address, Boynton Robinson returned to Selma and held hands with President Barack Obama during the commemoration event. Rep. John Lewis, D-Georgia was also a fixture in the civil rights movement and called Boynton Robinson one of the most dependable and tireless leaders in turbulent era of American history. Lewis noted that she co-founded a local civic group in the 1930s and held voter registration drives through the 1950s. “I am so glad she lived to see Dr. King lead a march from Selma to Montgomery, that she lived to see the Voting Rights Act signed into law, that she lived to see the amazing transformation our work gave rise to in America,” Lewis said. Boynton Robinson, born in Savannah, Georgia, worked as an educator there and with the U.S. Department of Agriculture in Selma. Tuskegee University officials have said she graduated from the school in 1927 and donated much of her personal memorabilia from the 1950s and 1960s to the university. She worked with the Southern Christian Leadership Conference, helped organize the Selma to Montgomery march and asked Martin Luther King Jr. to come to Selma to galvanize the local community. The Rev. C.T. Vivian worked closely with King and said he knew Boynton Robinson when she lived in Selma. Through fighting for voting rights, he said, she and others were fighting for the right to be considered fully American at a time when black people were still being denied basic freedoms. “You just don’t know how cruel, how non-thinking, how devilish, how hateful people could be. Just to hear this brings it all out for me,” Vivian said after learning of Boynton Robinson’s death, which came less than two weeks after the death of another leading civil rights activist Julian Bond.